Cut two pieces of parchment paper just the width of a 9-inch square pan, but long enough to curl up and over both sides of the pan. Layer the two pieces of parchment paper in the pan in opposite directions. Make sure you crease the paper into the bottom corners. Tip: A bit of cooking spray between the two layers helps hold the parchment paper in place. Spray the top layer of parchment with a light coat of butter-flavored cooking spray to help the marshmallow mixture separate after setting. Prepare a silicone spatula and a small (6-inch) offset spatula with butter-flavored cooking spray. Whisk together 1/4 cup powdered sugar, 1/4 cup cornstarch, and 1/4 cup cocoa powder. Using a sieve, sprinkle some of the powder mixture onto the bottom of the pan. Set remaining mixture aside. Combine 1/2 cup plus 2 tbsp cold water and vanilla extract in the bowl of a stand mixture. Stir to combine. Sprinkle 3 packs of gelatin on top of the mixture. Stir gently to ensure there are no lumps and set aside to bloom. Combine 1/2 cup water, 3/4 cup corn syrup, 1/4 cup honey and 1 1/2 cups granulated sugar into a 3-quart or larger saucepan over medium-high heat. Bring to a boil. Allow the mixture to boil, without stirring. Use a candy thermometer to watch the temperature of the sugar mixture, and continue boiling until the mixture reaches about 240°F, about 8-10 minutes. Pour a small amount of syrup mixture into gelatin mixture and whisk on low. Slowly add the remaining syrup. Carefully sprinkle in 1/4 cup cocoa powder at medium speed. When well combined, increase speed to high and beat until tripled in volume and fluffy, about 10 minutes. Using prepared silicone spatula, scrape the mixture into the parchment covered pan. Use the prepared offset spatula to smooth out the top. Set aside to cool at room temperature overnight. When the marshmallows have completely set, use the parchment paper to pull the marshmallow block from the pan and place on a cutting board. Use a serrated knife to cut the marshmallows into 1 to 2-inch squares. Toss the marshmallows in the remaining powdered sugar mixture. Resist the urge to stir the sugar as it boils. Doing so will cause the sugar to crystallize and will ruin the texture of the marshmallows. 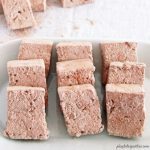 These homemade chocolate marshmallows, provide a nice, light chocolate flavor. For a more intense flavor, try increasing the cocoa powder in the marshmallow mixture by a tablespoon or two. Do not cover the marshmallows they set. Any covering will stick to the top of the marshmallows and ruin the smoothed out top. Keep warm water at-hand while cutting to rinse off your knife if it gets too sticky. Marshmallows are best if eaten within a few days, but will keep for a month or so if kept in an airtight container.